Day 14: Beacons of Hope – The San Francisco Bay Trail: It's Closer Than You Think! I took my yearbook home after the last day of the first year of middle school in 1981, threw it on the couch and basked in the glory of summer. My big sister, Karen, decided to pick it up and read through the “autographs” that some of my new friends from that year inscribed on various pages. Well, even in 1981, kids were getting ahead of themselves and she just about had a mid-college coronary after reading just a few. As luck would have it, or call it fate, she eventually had three boys of her own and all those years of practicing her protective nature on her little brother paid off. Oh, the glory days of the seventh grade. As I walked down Crown Memorial State Beach today it was abuzz with summer as middle and high school kids celebrated the last day of school. While some were getting doused with high powered “squirt guns”, others were still fine tuning their writing skills, scrawling intently in their friends’ year books. One school, however, was still in full learning mode with no summer break in store, but lots of summer fun, none the less! 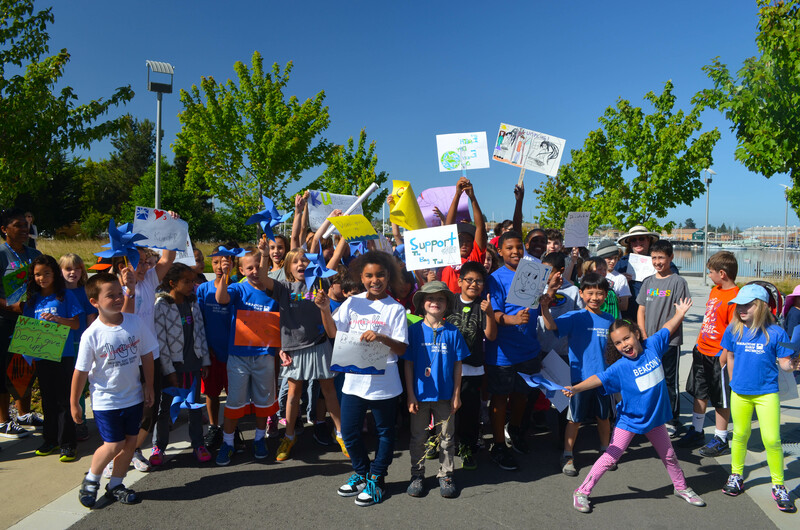 The kids at Beacon Day School in Oakland were out in force on the Bay Trail today and I have to admit I was touched by the overwhelming show of support they displayed for the Bay Trail. Waving dozens of spectacular, hand-crafted banners and signs in a multitude of colors, they cheered and waved and basically created a big, fun ruckus for the Bay Trail! Beacon Day School is just off the Bay Trail in Oakland by the Embarcadero, and the Principal, Damon Allswang, contacted me last week about bringing the kids out for a learning experience along the Bay Trail. How could I turn down an invitation like that! Part way through my Alameda Island hike today, Laura Thompson pulled me off the trail and ferried me to Union Point Park where the Beacon kids walked with me along the Embarcadero Bay Trail. I don’t think I have ever seen so many young kids so enthusiastic about learning and hiking and being outdoors. I could have hung out there all day and had kids crawling all over me the whole time but, alas, I had a walk to complete and they had more learning to do. With the laughter and cheering still echoing in my ears, Laura brought me back to the trail on Central Avenue at the spot where she picked me up earlier and I continued on toward Crown Memorial State beach and the Elsie Roemer Bird Sanctuary. Eventually I curled around the south end of the island and back up to the High Street Bridge where I reconnected with Oakland. The views west from Crown Memorial State Beach stretched from San Francisco to the south Peninsula. It was low tide and children and adults alike were wading far out into the Bay. The wet sand stretched gradually to the water’s edge hundreds of yards off shore. It seemed almost as if one could walk straight across to South San Francisco. As you might have noticed by now, most of my post images do not include people, focusing rather on memorable images of the trail or landmarks close by. Today warrants an exception as I post what is easily the most memorable moment thus far and it does not involve animals or landmarks. It is our future and our future is bright – in fact, it is a Beacon!